Every single day people struggle with wrapping their heads around file formats, types, extensions and overall complicated computer babble. You have got a huge collection of Audio files in your computer and still have a long list for downloading your favorite songs from the internet. If you care storage space more than video quality, for example, watch movie on mobile device, you should compress them to smaller file size. Now, you are not a single person to face such kind of problem of playing you favorite audio files. 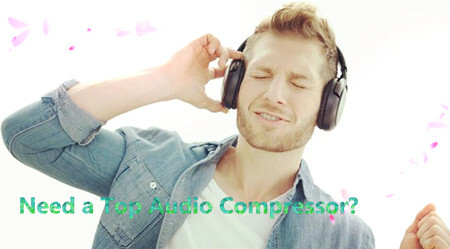 In this guide, you will get the Top Audio Compressor and All Audio files can be compressed. As the powerful Audio Compressor software, Pavtube iMedia Converter for Mac/Pavtube Video Converter Ultimate can fast compress audio in whatever audio formats to smaller file size with almost no loss of audio quality on Windows 10 or Mac Yosemite. It can compress MP3, WAV, FLAC, WMA, M4A, AIFF, PCM, OGG, AAC, AC3 and etc to smaller file size without change the audio format. It also can compress audio as well as convert audio to any other audio format like compress WAV to MP3, compress FLAC to MP3. * Compress MP3, FLAC, WAV, WMA, M4A, AIFF, MP2, OGG, AC3, RA, AU and etc to smaller file size as well as keep the same audio format. * Compress WAV to MP3, AC3, M4A or AU with almost no loss of audio quality. * Compress FLAC to MP3, M4A or AC3 with high audio quality. * Compress AIFF to M4A, MP3, AC3 and more audio format. * Compress M4A to MP3, WMA, AC3, RA and etc. * Compress WMA to MP3 with smaller file size. 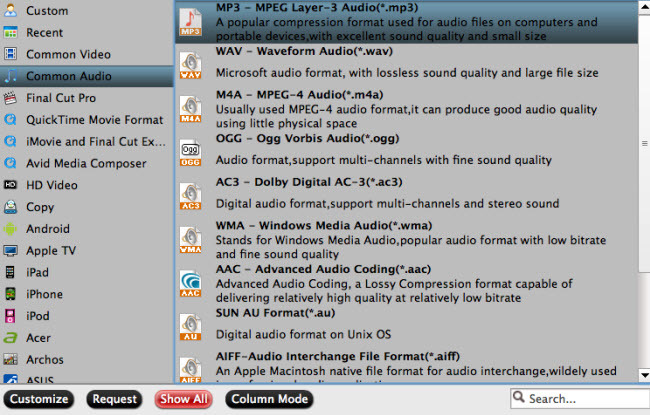 * Compress PCM, M4B, MPC, QCP, AMR, AWB, TTA, CUE, APE and etc to MP3. How to Compress Audio with Pavtube Audio Compressor on Mac Yosemite? Step 1: Load Audio Files. Click on “Add File” button to add the audio files that you want to play on Any deivces. Or simply drag your files or the folder where your files are to the program interface. Move your cursor to format and choose “Common Audio” and you’ll see a list of audio formats, choose one from them according to your devices supported audio formats which have been listed in the above text. 1.To reduce file size with audio compression software, you can choosing the following options to reduce file size. 2.Change Audio “Sample Rate(hz)” and “Bitrate(bps)” to a suitable file size. Choose any size as you want. 3.Trim audio file size. You can cut off the unwanted parts from a long audio to short ones by setting the start time and ending time. 4.Lower the bit rate 20-50% of the default to get small files. After reducing your Audio files to a smaller size, click “Convert” to start compress MP3, WAV, FLAC, AIFF, M4A, etc to a smaller size.